As specialists in the field of playground surfacing, Lanmark Designs works closely with XGrass, Play It Surfacing, VersaCourt, Mulch Outfitters and other members of The Recreational Group family of companies to design safe, functional and aesthetically pleasing environments for children’s play areas. We specialize in designing playgrounds that provide a safe, clean and well organized area for children to play. To do so requires an extensive knowledge of age appropriate equipment, safety surfacing options, proper activity zoning and more that comes with decades of experience in the design and installation of commercial playgrounds. Preschools throughout the country need to provide clean, safe environments that are entertaining and engaging. 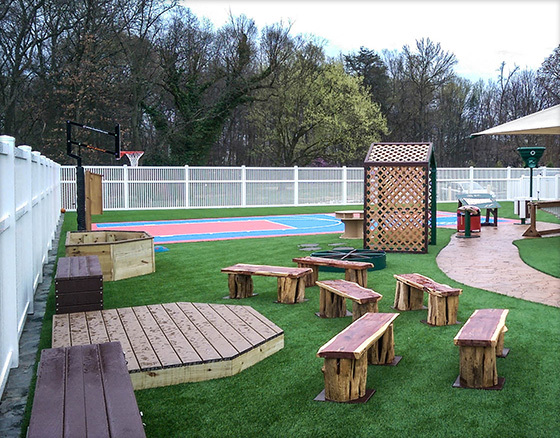 Designs like this utilize synthetic grass that stays clean year round, a low-impact VersaCourt game court, shaded space, a mini-theater and walking paths that safely transition children from one zone to another. 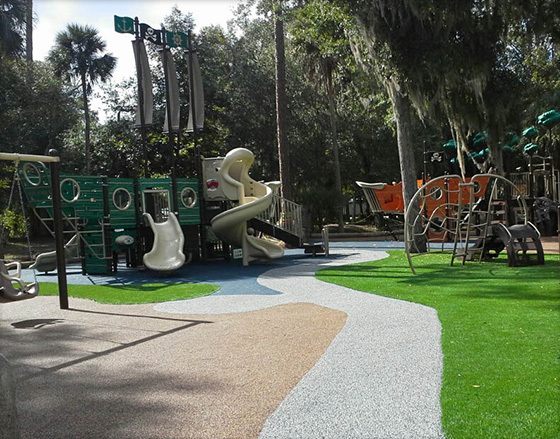 By blending colorful poured-in-place rubber from Play It Surfacing and safety turf from XGrass with plants and hardscaping, we can develop playgrounds that brighten up an entire area while providing a safe and clean area for children to play. With a focus on designing playgrounds using unitary surfaces like XGrass synthetic turf and Play It Surfacing rubber surfacing, our play areas are not only safer and cleaner than those with loose-fill surfacing, but it is very friendly to those with disabilities. Using colored turf and rubber surfacing from XGrass and Play It Surfacing, we can transform open spaces into engaging play areas like these kick ball and Wiffle ball fields. 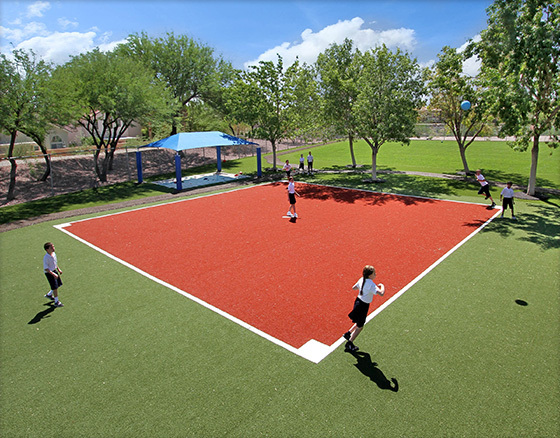 The kickball field features a "dirt infield" made from reddish-brown turf while the Wiffle ball field utilizes poured-in-place rubber from Play It Surfacing. Both solutions are virtually maintenance-free. 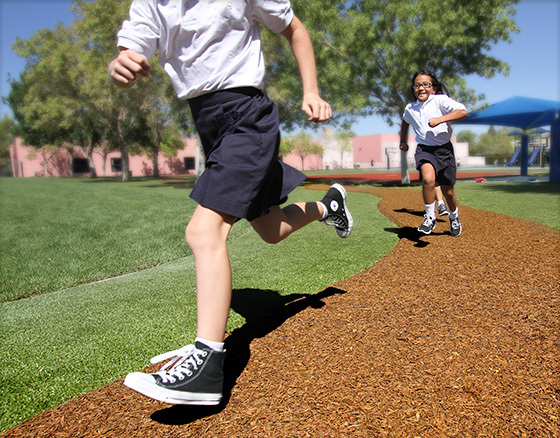 At Lanmark Designs, we know that creating clean and safe playgrounds extends beyond the surfacing under equipment. 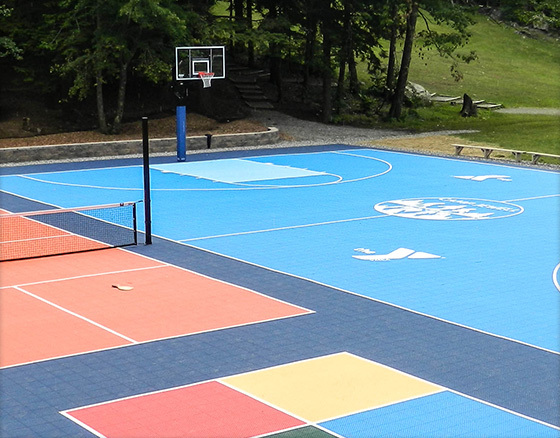 By integrating low-impact VersaCourt game courts into our designs, we effectively replace hot, hard asphalt and concrete surfaces. 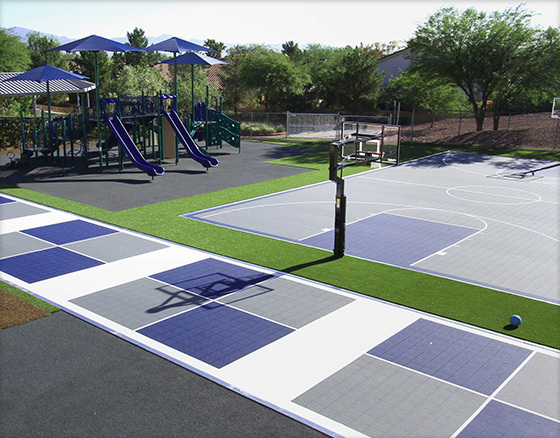 Plus, with numerous tile colors and the ability to customize with game lines and logos, VersaCourt game courts can truly bring a playground to life. Let the lansdcape architects at Lanmark Designs help with your next project.